With the responsive mobile player in Storyline 360, we’ve optimized learners’ experience on tablets and smartphones by moving the player out of the way and maximizing screen real estate for your slide content. Even better, you can now control how learners hold their mobile devices as they view your courses. Just set responsive playback restrictions. For example, let’s say you build a course that's meant to be viewed in landscape mode on tablets and smartphones, and you don’t want learners to have a subpar experience by holding their mobile devices in portrait mode. No problem. 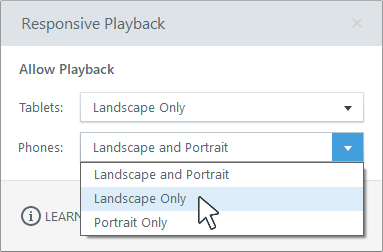 Just limit playback to landscape mode before you publish. 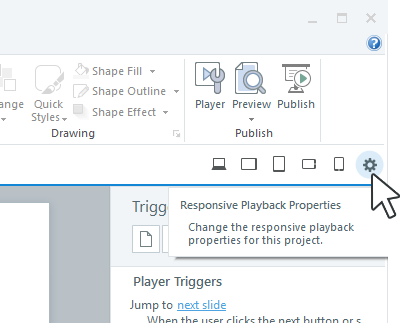 Click the gear icon at the end of the responsive preview toolbar in the upper right corner of the Storyline app. Use the Tablets drop-down menu to choose which orientation(s) learners can use when they view your course on tablets. Use the Phones drop-down menu to choose which orientation(s) learners can use when they view your course on smartphones. Click OK, then publish your course. Responsive playback restrictions won't work when you publish to Articulate 360. Storyline blocks always rotate with the Rise 360 courses where they're embedded, giving learners an intuitive experience on mobile devices. And Storyline courses always rotate with the Review 360 interface so stakeholders have a consistent experience when leaving feedback.